(UA)l where eL = effectiveness of the load heat exchanger. (m cp )min = minimum mass flow rate-specific heat product of heat exchanger (W/K). (UA)l = building loss coefficient and area product used in degree-day space heating load model (W/K). Equation (11.16) is applied in the range of 0.5 < Z < 50. The load heat exchanger size correction factor can also be determined from Figure 11.4 directly, obtained by plotting Eq. (11.16) for this range. Dimensioness parameter Z FIGURE 11.4 Load heat exchanger size correction factor. If the liquid flow rate in Example 11.2 is 0.525 L/s, the air flow rate is 470 L/s, the load heat exchanger effectiveness is 0.65, and the building overall loss coefficient-area product, (UA)l, is 422 W/K, find the effect on the solar fraction for the month of November. From Example 11.2, the value of the dimensionless parameter Y is 0.50. Therefore, Yc = 0.50 X 0.93 = 0.47. The value of the dimensionless parameter X for this month is 1.76, which from Eq. (11.13) gives a solar fraction f = 0.323, a drop of about 2% from the previous value. Although in the examples in this section only one parameter was different from the standard one, if both the storage size and the size of the heat exchanger are different than the standard ones, both Xc and Yc need to be calculated for the determination of the solar fraction. Additionally, most of the required parameters in this section are given as input data. In the following example, most of the required parameters are estimated from information given in earlier chapters. 1. The collectors face south, installed with 45° inclination. The performance parameters of the collectors are FR(ja)n = 0.82 and FRUL = 5.65 W/m2-°C, both determined from the standard collector tests. 2. The flow rate of both the water and antifreeze solution through the collector heat exchanger is 0.02 L/s-m2 and the factor FR /FR = 0.98. 3. The storage tank capacity is equal to 120 L/m2. 4. The (ia)/(Ta)n = 0.96 for October through March and 0.93 for April through September. 5. The building UA value is equal to 450 W/K. The water to air load heat exchanger has an effectiveness of 0.75 and air flow rate is 520 L/s. 6. The ground reflectivity is 0.2. 7. The climatic data and the heating degree days for Nicosia, Cyprus, are taken from Appendix 7 and reproduced in Table 11.4 with the hot water load. The monthly heating load (including hot water load) = 6.80 + 3.5 = 10.30GJ. The results for all the months are shown in Table 11.5. Next, we need to estimate the monthly average daily total radiation on the tilted collector surface from the daily total horizontal solar radiation, H. For this estimation, the average day of each month is used, shown in Table 2.1, together with the declination for each day. For each of those days, the sunset hour angle, hss, is required, given by Eq. (2.15), and the sunset hour angle on the tilted surface, h'ss, given by Eq. (2.109). The calculations for the month of January are as follows. And finally, Ht = RH = 1.62 X 8.96 = 14.52 MJ/m2. The calculations for all months are shown in Table 11.6. Therefore, the minimum capacitance is for the air side of the load heat exchanger. When these values are used in Eq. (11.13), they give f = 0.419. The complete calculations for all months of the year are shown in Table 11.7. Klein et al. (1977) developed for air-based systems a design procedure similar to that for liquid-based systems. The f-chart for air-based systems is developed for the standard solar air-based solar energy system, shown in Figure 11.5. This is the same as the system shown in Figure 6.12, drawn without the controls, for clarity. As can be seen, the standard configuration of air-based solar heating system uses a pebble bed storage unit. The energy required for the DHW is provided through the air-to-water heat exchanger, as shown. During summertime, when heating is not required, it is preferable not to store heat in the pebble bed, so a bypass is usually used, as shown in Figure 11.5 (not shown in Figure 6.12), which allows the use of the collectors for water heating only. 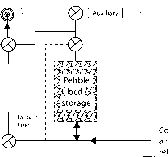 FIGURE 11.5 Schematic diagram of the standard air-based solar heating system. FIGURE 11.6 The /-chart for air-based solar heating systems. A solar air heating system of the standard configuration is installed in the same area as the one of Example 11.2 and the building has the same load. The air collectors have the same area as in Example 11.2 and are double glazed, with FrUl = 2.92 W/m2-°C, FR(Ta)n = 0.52, and (ra)/(Ta)n = 0.93. Estimate the annual solar fraction. A general condition of air systems is that no correction factor is required for the collector heat exchanger and ducts are well insulated; therefore, heat losses are assumed to be small, so FR /FR = 1. For the month of January and from Eqs. (11.8) and (11.9). From Eq. (11.17) or Figure 11.6, f = 0.147. The solar contribution is fL = 0.147 X 35.2 = 5.17 GJ. The same calculations are repeated for the other months and tabulated in Table 11.8. Therefore, compared to the results from Example 11.2, it can be concluded that, due to the lower collector optical characteristics, F is lower. Air systems require two correction factors, one for the pebble bed storage size and one for the air flow rate, which affects stratification in the pebble bed. There are no load heat exchangers in air systems, and care must be taken to use the collector performance parameters FRUL and Fr(toi)„, determined at the same air flow rate as used in the installation; otherwise, the correction outlined in Chapter 4, Section 4.1.1, needs to be used.